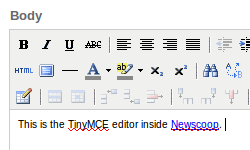 The text editor in Newscoop (a program called TinyMCE) enables contributors to perform extensive article formatting from within a web browser. You may be familiar with most of the functions of TinyMCE from using word processors such as Microsoft Word or LibreOffice: functions such as bold, italic, underline, and text alignment. Move your mouse over the small icons to see a tooltip explaining what they do. Standard formatting keyboard shortcuts also work, including Ctrl+b for bold and Ctrl+i for italic). The editor that you see in your own Newscoop installation may look different to the one shown above, depending on the extent of your user permissions. The editor should contain all the functionality you need for your publication, but if you feel something vital is missing, you could discuss the matter with your Newscoop system administrator. There are several Newscoop-specific features in the editor. The first is Insert/edit internal link, which enables you to select a word or phrase from your article and link it to an article within the same Newscoop publication, or within another publication on the same Newscoop server. Clicking this icon opens a pop-up window with drop-down menus enabling you to select a specific Language version of a Publication, Issue, Section and Article to link to. There is also a drop-down menu for the link Target, such as opening the linked article in a new browser window. After you click the Insert button, the internally linked text will be shown in blue and underlined, like a web link. Selecting some text in the article then clicking the File Attachment paperclip icon in the TinyMCE toolbar opens a pop-up window. This window enables you to create a download link from the specific word or phrase selected to one of the files attached to the article. See the chapter The Sidebar for details of how to attach files to articles. Another Newscoop-specific feature is Newscoop Subhead, which enables you to specify where your text will be broken into different pages. (Your Newscoop theme must support this feature in order for the page breaks to work). 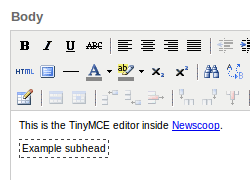 Enter the text for the subhead into the editing window, select it with the mouse, then click the Newscoop Subhead icon. The subhead text will now be shown with a dashed outline. To the right of the Newscoop Subhead icon, click the Insert image picture icon to select from the images attached from the article, or click the Insert/Edit Embedded Media film-strip icon to insert a link to an attached video file. Attaching images and video files to articles is covered in the chapter The Sidebar.